Even if you've never met him, you know my Cycling '74 colleague and friend Tom Hall; It was his dulcet Tasmanian voice that urged you on through your first Max for Live device-making tutorials. His wide-ranging curiosity and enthusiasm fill various personal and Cycling '74 social media channels. If you were a programmer, you might almost think of him as one of your favorite "pointers to arrays of structures." But - of course - there's a person at the point where all those tweets and postings and presentations start. A person who makes what I think of as really interesting noise, as it happens. The arrival of a new recording on the Elli label (Fervor) a couple of weeks back reminded me that it would be fun to introduce you to Tom - that guy who introduces you to cool stuff - in a different way. Hey, Tom. Thanks for taking the time to chat a bit about your work. I've never had much of a chance to ask you how you work, so this will be fun for me. Compared to Many Days End - your last work I heard - this new release, Fervor, seems like something of a departure from what I'd have expected. What's going on? A lot of things have changed since Many Days End and - funnily enough - you’re not the first person to suggest the new release is a departure. I’ve become a lot more aware and attuned to my surrounds in the past three years - this is immediately obvious with my ear having tuned into the Los Angeles accent (having now lived in LA for 6 years). Other things would be working with composers across LA, too. I’ve picked up a lot of traditional music theory and understanding that I wouldn’t have otherwise had, given my arts background. I’ve also re-built my audio hardware setup. Having had to purge a little upon moving to the USA because of the differences in power (I’m not a fan of step-down converters). My programming skills have improved exponentially through working at Cycling ‘74 for nearly 5 years, too. But I would say last but not least that I really feel like I’ve found a home in the Los Angeles sound community in the past three years. There’s a phenomenal amount of talented people in LA and you can almost step out any night of the week to see a great live music show that has you driving home very inspired. It certainly seems like LA has expanded a lot creatively in the past 3 years, and I’m very excited about it. One of the things about entering a new community of artists from the outside is that it makes you think a little bit about where you yourself come from. What do you think you’re learning and expanding into as a result of your time in Los Angeles? Once you get to Los Angeles and spend some time here getting to know people, I realized that a lot of the population are not from here - almost everyone is a transplant. After a few years of going to shows and hanging around, you get to know a lot people if you’re open and honest. 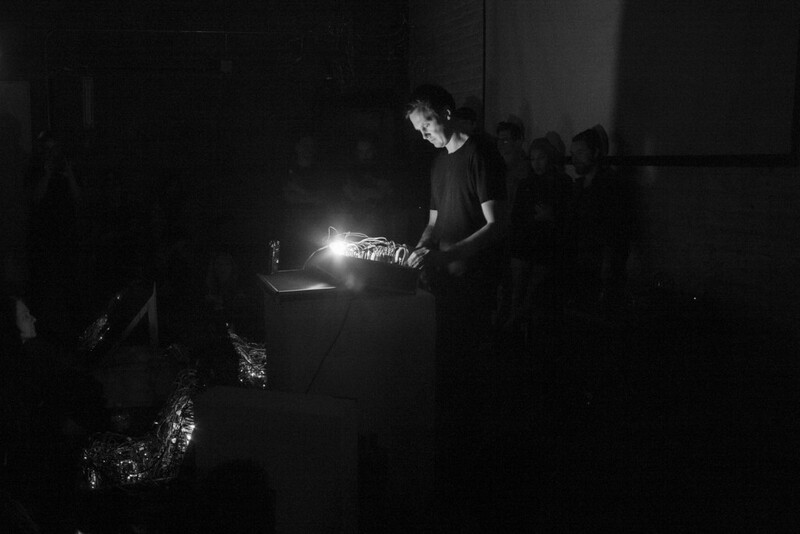 Los Angeles can be closed off in certain areas (the whole thing about cracking Hollywood, for example), but the experimental music and electronic scene is very open in general and is really thriving right now, I believe this is owing to a lot of active people moving here in the past 5-7 years. I’ve learned a lot from Los Angeles. The city in itself requires a level of resilience - just navigating it, for example. 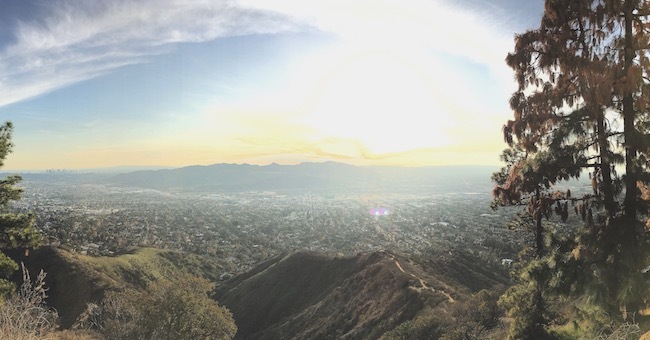 Despite the size of Los Angeles, I try my best to be open about sharing my knowledge and skills about music, audio/video programming and composition wherever possible - I owe it to those who helped me in other cities along the way. I simply wouldn’t be here without them. It’s not something I understood at all when I was younger (unfortunately), but having the ability to share skills and knowledge with someone else and to empower them to pursue their creative outcomes is one of the best things you can do in life. I absolutely love it. I’m fortunate to have that opportunity in Los Angeles - from friends and peers to Hollywood composers and celebrities and, in turn, I also receive skills, knowledge and inspiration in return. I’m really thankful for that. And while I’m at it, do you think that you yourself have a kind of regional identity that helps to explain something about your work? Like my creative process, I feel like I’m pretty much a hybrid these days. Speaking artistically, I think my ‘regional identity’ is a combination of my nationality and the areas where I first developed as a creative. I tend to just put it out there, tell it as it is and see how it does. I’m not too precious and quite like constructive criticism. I certainly feel like that each area I’ve lived or travelled I’ve collected something - some knowledge, skill or advice and I continue to carry that with me everyday. I really don’t think regionally these days. I truly wish the World was borderless. The tool set is pretty extensive to be honest. I’m certain there’s something I used for a small part of these recordings that I simply won’t remember. 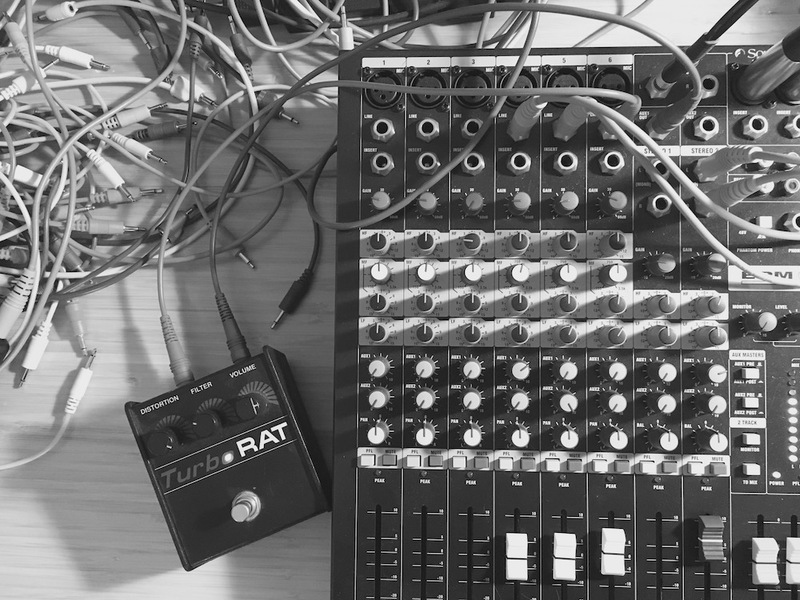 These recordings used a combination of a Eurorack modular system, a 5U Mu/dotcom system, some pedals such as the ProCo Rat and Boss Mega Distortion (my all-time favorites), and a selection of my favorite Nord Synths - the Lead 2/G2 and Micro Modular. But do not discount Max! Max threads its way through the process from beginning to end in various forms - from data control to sound processing. Wow. That's quite a collection of tools. Do you think you could maybe walk me through how the two pieces on the album were created and assembled? Both tracks started in two different locations and almost ended up back where the other started. I was happy with how it sounded live and took it back to the studio to push it further. the pounding bassline and progression in the track made me think of someone small walking across a vast field on the way to battle an evil giant - a little David and Goliath, a little Bernie Sanders vs the conglomerate that is the USA political system. 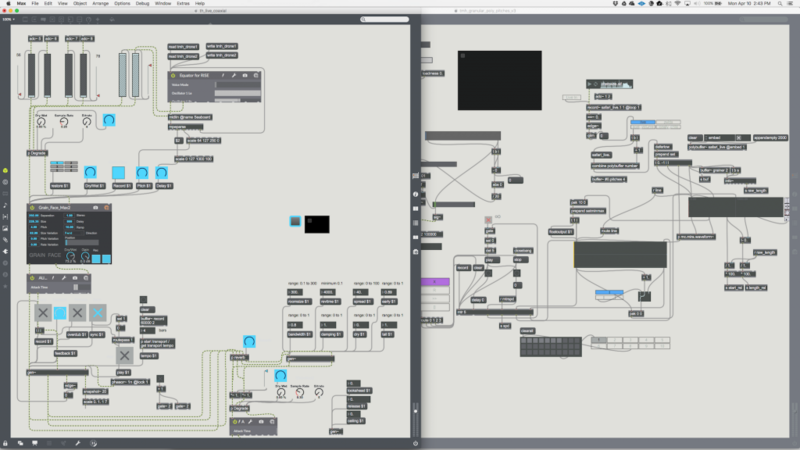 I recorded it in multipass, line by line, and then took passages of it into Max/MSP for some granular processing. This was really subtle processing though, as I wanted to keep this as a piece that I could still play live in some shape or form. Final mixing was completed in Logic with a selection of UAD plugins. Ah. The “granular processing as subtle effect” gambit. There are lots of granular processing options out there for MSP - some people write our own or take Nathan Wolek’s externals and start from there, some folks use Robert Henke’s granular beast from Ableton Live, and some folks scour the Max Forum. What’s in your granular toolbox? My granular toolbox is custom built. This was a process I undertook over the past year and still improving on. After years of using dedicated externals like munger~ and other similar objects, I wanted to build something that I could use live both with samples and line input and I wanted it to all be vanilla Max objects. Only the hunted know (track 2) started inside Max - a live performance patch that I’ve been working on for a few years for live processing. The flow in the patch contains a degradation effect into polyphonic granular effect into a sound-on-sound looper made in gen~ that can either sync to a number of bars or run free, into a reverb made in gen~, and then out through another pass of distortion. So you’re a gen~ guy, huh? What did your first steps in using gen~ looked like? Where did you start and what made you decide to take the leap? It seems like lots of people have really different answers to that question…. I flailed into gen~ in the early days when it was first released. But, I remember hearing the Moog Ladder Filter for the first time - having heard and been a fan of the real thing - and this was enough for me to continue pursuing it. Of course, I followed the documentation project you generated online pretty closely and before I knew it my earthly delays were sound-on-sound loopers, I’m not sure that my looper needs to be in gen~, but it does run efficiently and it's glitch free - so I’ve left it as is now for some time. Regarding Only the hunted know - the second track on the EP, I used Roli’s excellent Equator MPE synth rather than live input with a selection of my own original Mellotron samples loaded into a custom preset. I played the melody and manipulated aspects of the effects in Max all from the Seaboard RISE. I completed multiple passes of this melody, track, and effects in Max and tracked them into Ableton Live. Some further processing took place courtesy of some custom Max for Live devices I made years ago, and then I mixed using UAD Plugins and Hardware emulation. How hard was it to set up the custom preset? Lots of people I know - and I guess I might be one of them - never venture much beyond Equator presets. What’s the process look like? Wow, thanks. What source materials am I hearing here? 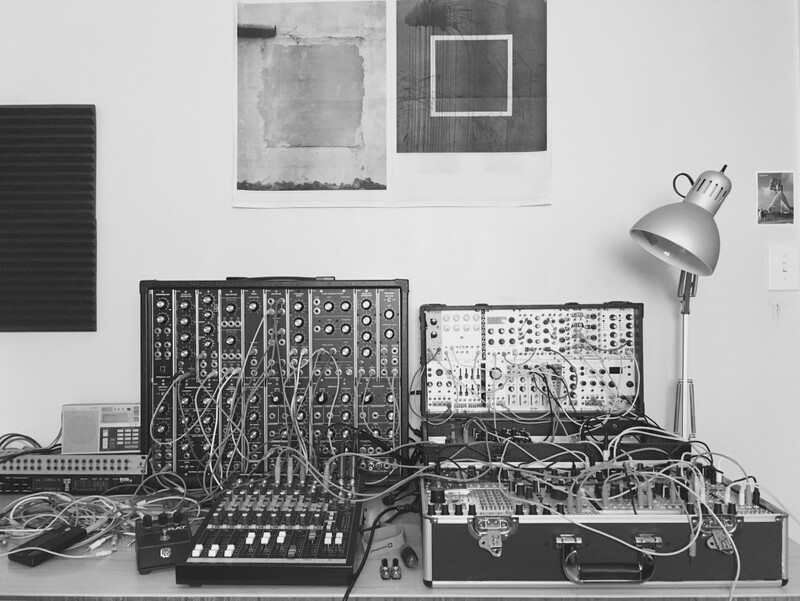 The sonic source materials include the classic Intellijel Dixie and 5u/Q106 VCOs, Mutable Instruments Elements and Mellotron Samples. Of course, these get processed in such a way that they end up resembling organs and pianos and other ethereal-type sounds. Are the treatments (stomp boxes)/audio modifications done in hardware or software (or both)? A real combination of both. In fact, some of the material was processed through a feedback loop from Max to Modular to outboard FX and back again. It certainly suffers a level of degradation each round, but I find this suits my work - I’m not to into the perfect sound of digital. I much prefer it when the lines are blurred. I spent a lot of time in my formative years listening to metal and going to metal shows and the sounds were never clean. Always blurred. But electronics started to creep into my life at University. My friends were putting on late night Drum’n’Bass nights, I’d go to the early metal shows and then go to their D’n’B nights afterwards - not because I was interested in D'n'B, but more because it was a place to keep drinking. But the sound of both those Worlds stuck with me. While studying in Japan in the early 2000’s, I started really getting into electronic music and it was here that I discovered Max/MSP. While almost every change in trajectory in my life since can be linked to Max, that hybrid sound of distortion and D’n’B has stuck with me. How are you making that feedback loop - running it through your external interface? Expert Sleepers? I’m using sends and returns on a mixer to an audio interface. However, I recently picked up an Expert Sleepers ES-8 which, is going to open up a World of hybrid sound processing for me. It’s not for everyone, but I really couldn’t care less about the analog vs digital argument. It’s the end result that counts. I'm not really sure where Max is in this recording - in fact, this might be a good "Max does not sound like *anything*" record. Where's Max? Perfect! There’s one thing in my work that’s always an underlying goal and that’s to transcend the tools used to make the work. I don’t like it when it’s inherently obvious what effects preset or manipulation was used. In saying that, I’ll happily talk about the tools. Let me turn the question around for you to start, then. Do you think that Max has a 'sound' as such - either what comes out of the dac~ or the more subtle idea that the process of working with Max can be identified? I thought it did for many years, but with current technologies in hardware catching up to digital and Max advancing in areas such as gen~ as I said about the Moog ladder and diode filters, the lines have blurred. These days, I probably fly a bit too close to the sun to elaborate more on this accurately, but I do think that I could put people through a blind test with my analog MU modular and Max (with the right patching) and that they wouldn’t be able to tell the difference. Some people talk about there being a terrific difference between 'thinking in analog' versus nearly everything else. Do you see the process of working on this recording as radically different than recordings you've made before? I wouldn’t say I think 'in analog,' although I’ve certainly spent more time in/on it in the past few years than ever previously before in term of instruments. But really, my sound exploration commenced well over a decade ago now with an interest in the resynthesis of found sound. My first album in fact, Fluere, was a piece purely focused on recordings taking from the Story Bridge in Brisbane, Australia, a closely related Bridge to the famous Sydney Harbor Bridge. Bridge recordings, huh? Could you take just a minute and talk a little bit about how that interest in found sound came to be part of your process. Given what you’d said about those metal or D&B evenings being the way you came to terms with distortion and its place in your work now, I’d be curious to know about how something like Fluere fits into this jigsaw puzzle…. My initial interest in found sound came from being thrown head first into media studies in Japan. We were learning about ProTools recording and fidelity and I took the recording units we had available to us and went out into regions of Kyoto - the sounds I was hearing there were fascinating and like no other that I heard before (my trip to study in Japan was my first time abroad). I really loved taking these sounds back to my studies and synthesizing them further, seeing what happened with manipulation and how different found sound resulted in different outcomes. However, the sound I’m searching for I still haven’t found! All I know is that it’s somewhere hybrid and it’s a combination of piano, mellotron, synthesizer, ambient atmosphere and a few other FM-oriented sounds, I’ve been chasing that sound for almost 15 years now. The very mention of the word Mellotron brings me to another question: Do you think orchestrally, or is the sense of it I get in your work something that comes from the process learning to sculpt and layer? There’s something really organic sounding about the Mellotron, it’s certainly not thin. The tone the thing produces is amazing and the inherent texture makes for great sounds to sculpt. Further, sadly, none of the emulations come close. Since you're a Max guy, let's extend that question in terms of Max itself. If this is a 'hybrid' recording, how do the Max and analog worlds overlap? How are they different? Definitely hybrid. In fact, I’ve always worked this way. I do believe the Max and Hardware/Analog Worlds interact almost perfectly. On a regular basis, I learn things in both domains and with little modification I’m able to swing around and complete that exact same action/event in the other with little adjustment. I honestly don’t know of too many other digital/analog areas in sound that you can complete this same action with such ease. Something I like about Max is it really doesn’t tell you or lead you to a production path or functionality that has been predetermined by user experience designers and engineers. This is something that has always appealed to me about Max, and the same happened with my path into hardware modular systems almost 10 years ago - the same appeal and sense of freedom. This kind of working environment is the of the utmost importance for me. I need to ensure that the possibility for the 'happy accident' is there... a kind of controlled chaos. I first came across that term when I was studying photography (2002) and discovered the renowned photographer Wolfgang Tillmans. He spoke at length about how his processing and chemical use in development was more improvised within certain ranges to allow the possibility for unusual chemical reactions and the happy accident. This has stuck with me ever since.